Anton Chekhov described kulebyaka as being very appetizing and ‘shameless, in all its nakedness’ due to its lavish filling. Here’s how to cook it. 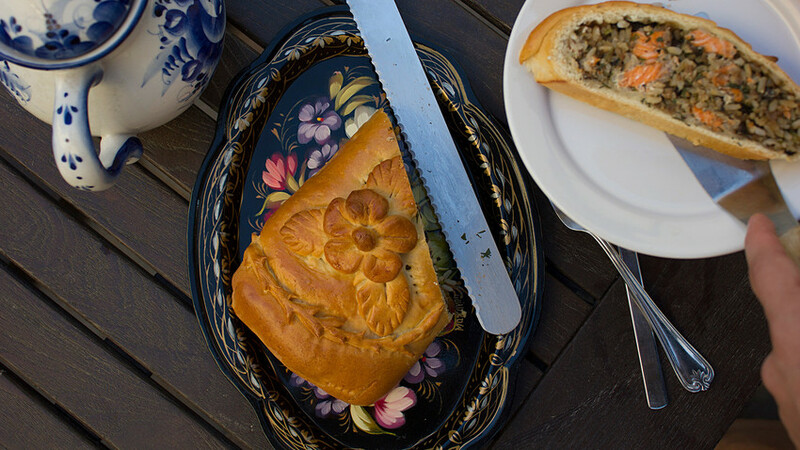 Russian pies or pirogi occupy a special place on the Russian table. What's more, they have stayed true to themselves, and avoided foreign influences – like a true Russian. Originally, pirogi were only made and eaten during special events. 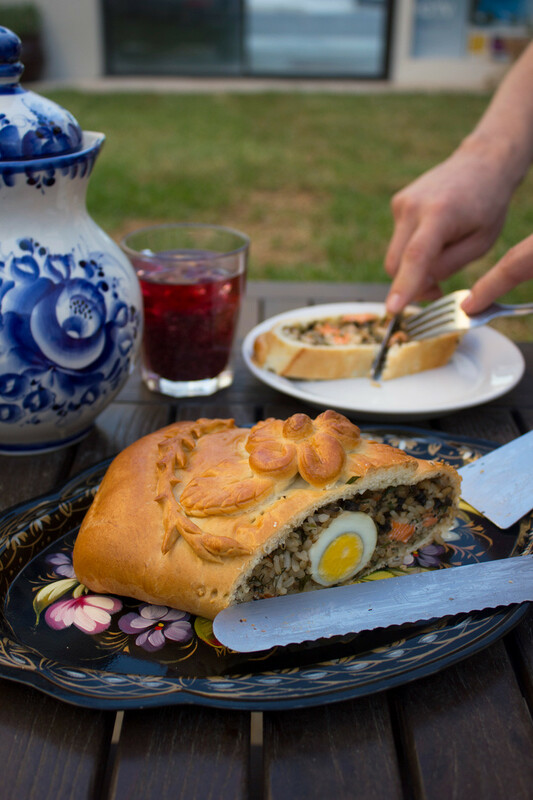 The word pirogi itself comes from the word “pir,” which means “a banquet” or “festivity.” Of course, every festivity had its own special type of pie, and this is the reason why there are so many varieties in Russia. You’ll find them with different doughs, stuffing, shapes, sizes, and flavors. 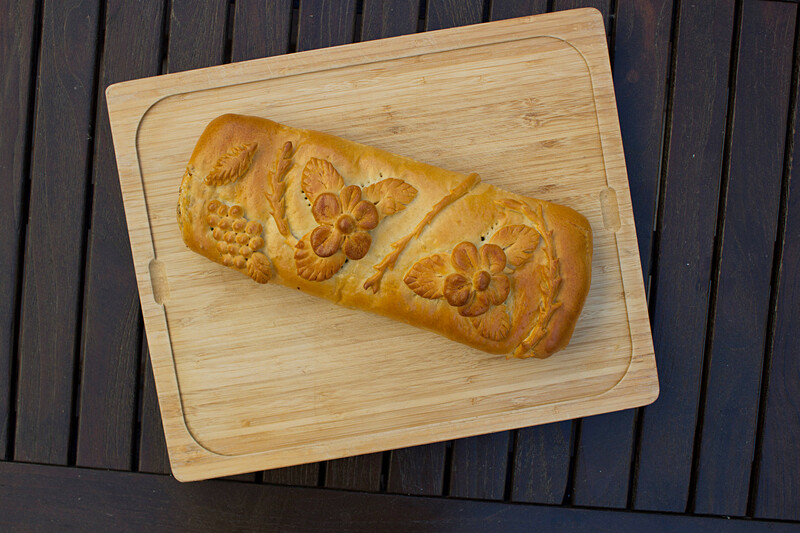 One of the most labor intensive and fanciest pies to make is called kulebyaka. It’s not just a pie, it is an entire meal in one dish. The classic kulebyaka has not one type of stuffing, but several and is traditionally made with fish. The most unusual ingredient commonly included in the grand version of this dish is vesiga, the spinal marrow of the sturgeon. It was commonly sold in the shops up until the 1970s. Some kulebyaka experts even say that a piece of ice was put inside the pie to melt while cooking to make it as juicy as possible. Some of you may have heard that in 19th century writers like Ivan Turgenev and Nikolai Gogol sang the praises of kulebyaka. But I would like to mention a short tale called “Sirena” by Anton Chekhov. In this tale, the judges gather in the meeting room for a small break and since all of them are hungry, they start talking about food. So, one of the characters enthusiastically describes kulebyaka as being very “appetizing, shameless, in all its nakedness.” He even imagines himself winking at it, because of the fat dripping from it, like tears from all those juicy, rich fillings. Yum. French chefs working in Russia during the 19th century wanted to bring kulebyaka to the world, and due to the demands of “haute cuisine” they altered the recipe. For example, they used a more delicate and sophisticated dough, game meats, exotic mushrooms, and salmon. The dish was so popular in Russia in the early part of the 20th century that Auguste Escoffier, the famed French chef, brought it to France and included recipes for it in his book, The Compooklete Guide to the Art of Modern Cookery. Nowadays, the recipe for kulebyaka is still taught in French cooking schools. The pie became a kind of culinary symbol for wealth and abundance. Even during Lent when you bake kulebyaka using only grains and vegetables, it will always be the center of attention on the table. 1. Start by dissolving the yeast in tepid water and let it sit for 3-5 minutes. It should foam up a little, that way you know that your yeast is alive. 2. 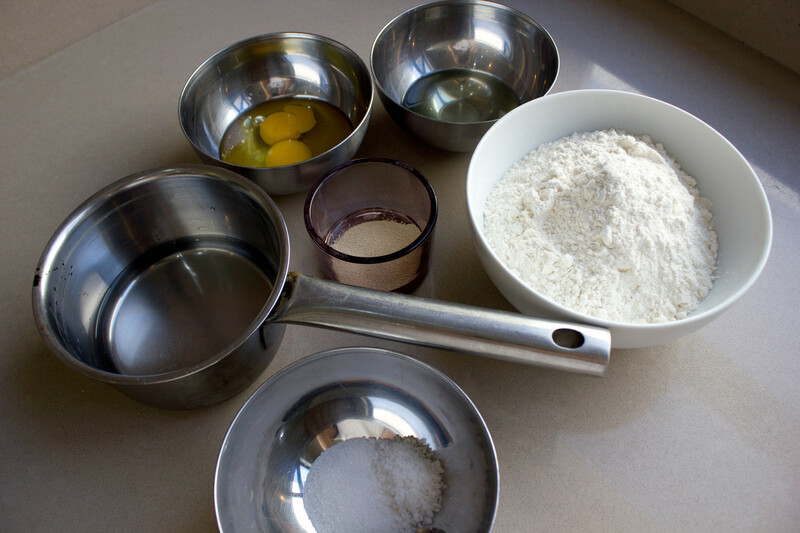 In a bowl, combine the flour, salt, sugar, and give it a light mix. Add the oil, eggs, and active water/yeast mixture. Combine until everything comes together. 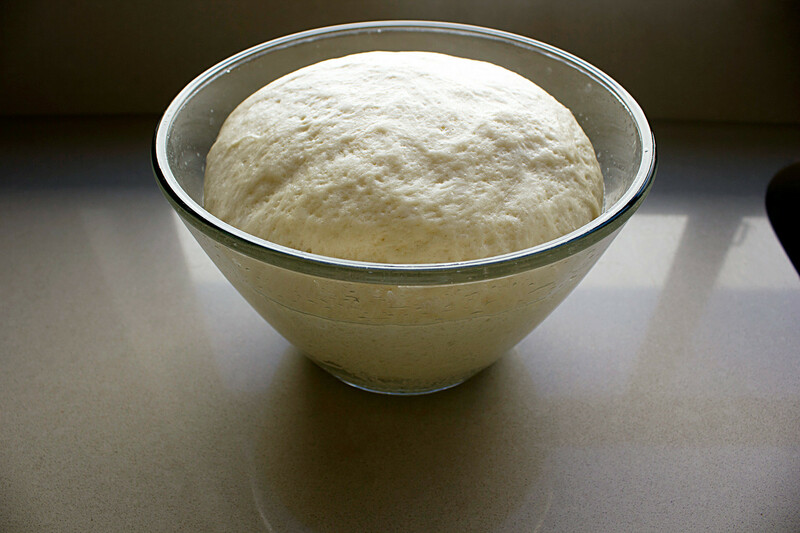 Knead the dough by hand or in a mixer until it’s completely soft and slightly elastic. It shouldn’t take you more than 10 minutes. 3. Now cover the dough with cling film and leave it to rest in a warm spot until it doubles in size, which should take about 90 minutes. 4. While your dough is rising, cook the rice. We all have our special way of cooking rice, so go ahead and cook it however you prefer. 5. Dice the onions and mushrooms and saute them separately on a medium-high heat. The onions should be nice and soft, you can even add a pinch or two of sugar for extra caramelization. Leave to cool. Repeat with the mushrooms. 6. Now you need to cook your eggs. Simply place them in water and bring to a boil. As soon as they boil, cover them with a lid, turn off the heat, and leave them there for 6 minutes. Then shock the eggs with ice cold water and peel them. 7. Your salmon should be clean and without any scales, once that is done, cut it into small cubes, about 1 cm2. 8. 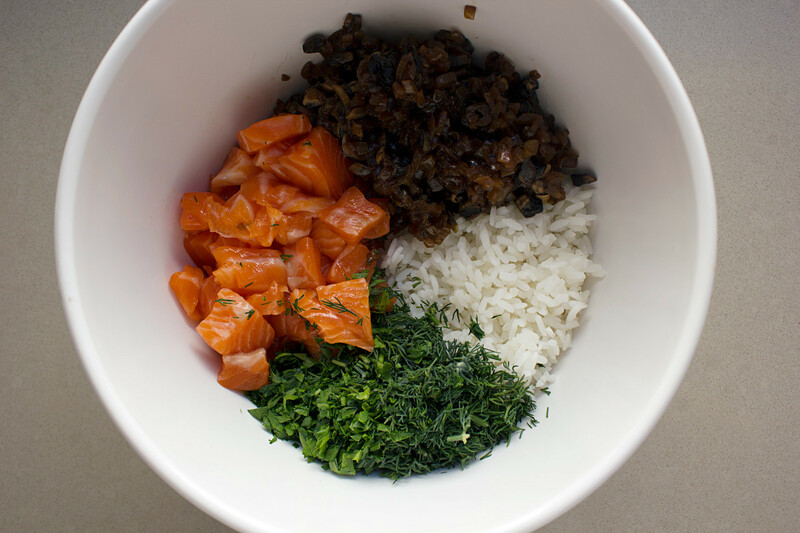 When all your ingredients are cooked and chilled, mix them together (rice, onions, salmon, herbs, and mushrooms) and season with salt and pepper. Put the eggs aside. 9. By this time your dough should have been doubled in size. Punch it to get rid of all the air inside and form a nice ball. 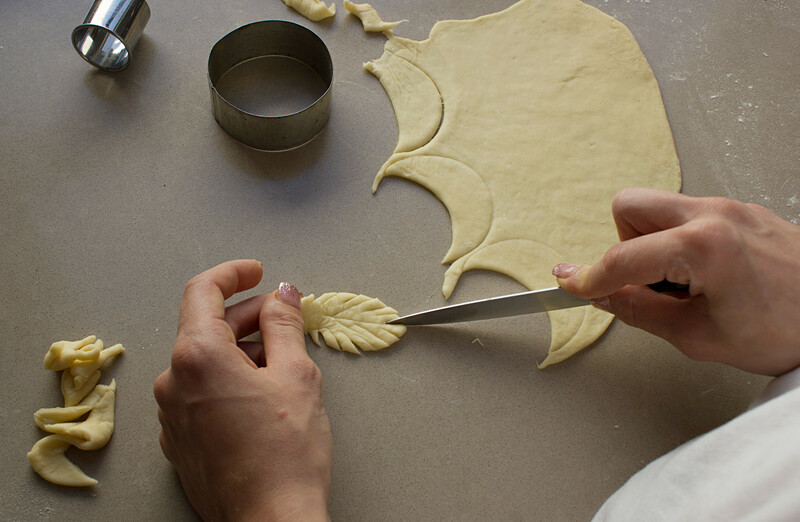 Separate a small portion of the dough for the decoration. 10. With a rolling pin, roll the dough on top of a floured kitchen towel into rectangle. It should be 0.5 cm thick. 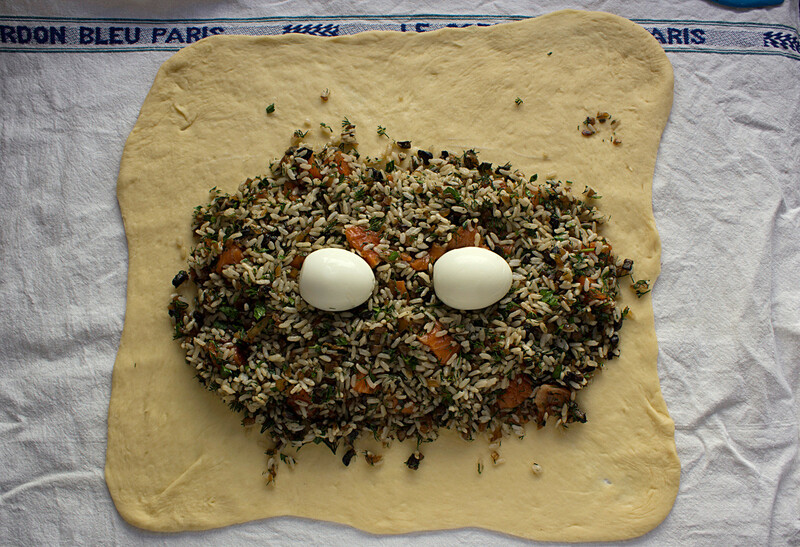 Put you stuffing in the middle of the dough and place your eggs on it. With the help of the kitchen towel, roll one side of the dough towards the stuffing, enclosing it as much as you can. Carefully, continue rolling the dough with the stuffing, making sure you get to the end with the seam side down. Tuck in the sides of excess dough under your roll. 11. Preheat the oven to 180°C and get your baking tray ready with some parchment paper. Since we rolled our pie on a towel, you can easily transfer it to the baking tray, remember to have the seam side down. 12. You are almost there. All you have to do is to decorate your pie. Use that portion of dough we reserved earlier. Do whatever design you love best. This is where you can let your creative side shine. The possibilities are endless. If you need help sticking you dough design to the pie, use a little water. Before you bake your kulebyaka, brush it with some egg wash and carefully poke some holes in the sides with a fork so it doesn’t burst. Bake for about an hour until golden brown. 13. Once it is done, take it out and let it cool under a towel for at least 10-15 minutes. There you have it, your very first (or maybe not) kulebyaka. It seems like a lot of steps, but they are really not complicated and it is so worth it at the end. Do you know how to cook kulebyaka with cabbage and eggs? Check our recipe.